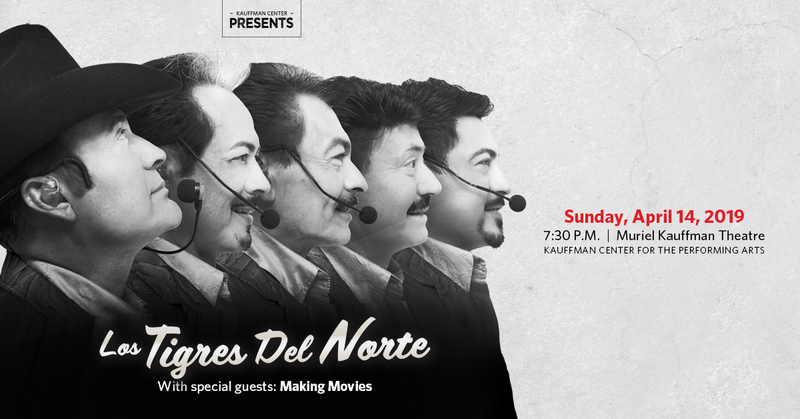 Los Tigres del Norte will perform at the Kauffman Center for the Performing Arts on April 14, 2019, in Muriel Kauffman Theatre. Local band Making Movies will open the show. Los Tigres del Norte have reinvented Mexican popular music with their modern take on norteño with traditional cumbia, bolero and rock rhythms. Along the way, the band has earned several Grammy and Latin Grammy Awards, sold 37 million records and earned a star on the Hollywood Walk of Fame. Opening the show, Making Movies blends pulsing Afro-Latino rhythms, psychedelic jams and rock ’n’ roll swagger. Tickets for this event range from $49 to $119 plus applicable fees. Tickets are on sale now and are available through the Kauffman Center Box Office at (816) 994-7222, via the Kauffman Center mobile app, or online at www.kauffmancenter.org. La legendaria agrupación de música regional mexicana, Los Tigres del Norte, se presentará en el Kauffman Center for the Performing Arts el 14 de abril. La banda local Making Movies estará a cargo de la apertura de la presentación. Los Tigres del Norte han reinventado la música popular mexicana con su toque moderno a la música norteña con cumbia, bolero, y ritmos de rock tradicionales. Durante el transcurso, la banda ha recibido varios premios GRAMMY y Latin GRAMMY, vendido sobre 37 millones de discos y obtenido una estrella en el Hollywood Walk of Fame. Making Movies combina ritmos Afro-Latino, psicodelicos y de rock ’n’ roll. Boletos para este evento fluctúan entre $49 a $119 más impuestos. Los boletos salen a la venta el Viernes 15 de febrero a las 10 a.m. Boletos estarán disponible a traves del Kauffman Center Box Office (816) 994-7222 y via la aplicación móvil del Kauffman Center y online en www.kauffmancenter.org. The Kingdom Choir is best known for their show-stopping rendition of “Stand By Me” at the Royal Wedding of Prince Harry and Meghan Markle in May 2018. The performance, seen by a global audience of over 2 billion, instantly catapulted The Kingdom Choir to worldwide fame. Now, they are performing at the Kauffman Center for the Performing Arts in Helzberg Hall on October 1, as part of the 2019-2020 Kauffman Center Presents series. The Kingdom Choir is composed of extraordinary singers from all over the southeast area of England. Founded in 1994 by award-winning conductor Karen Gibson, the choir draws from various Christian traditions to create a sound that reflects the community they share through their warm energy and enthusiastic performances. Over the years, the group has made many public broadcast appearances on premier religious radio and television broadcasts in the UK. The group has performed alongside artists such as the BBC Philharmonic, Elton John, Luther Vandross, the Spice Girls, Andraé Crouch and Fred Hammond among countless other high-profile musicians. Tickets for this event range from $19 to $59 plus applicable fees and go on sale to the public at 10 a.m. Friday, March 1. Tickets will be available through the Kauffman Center Box Office at (816) 994-7222, via the Kauffman Center mobile app and online at www.kauffmancenter.org. Known for her work as the host of Iyanla Fix My Life on the Oprah Winfrey Network, Iyanla Vanzant will speak in Muriel Kauffman Theatre on Friday, August 23, 2019. The event is part of the 2019-2020 Kauffman Center Presents series and is presented in partnership with Mills Entertainment. Rising from the Brooklyn projects, Vanzant is now a New York Times best-selling author, Emmy Award winner and among the country’s most celebrated public speakers and spiritual life coaches. The tour celebrates the 25th anniversary of her best-selling book Acts of Faith. The encouragement, comfort and wisdom found in the book travel from page to stage with Iyanla’s signature straight-talk, message of love, forgiveness and humor. Tickets for this event start at $34.75 plus applicable fees and are on sale now. VIP tickets include a premium seat and a copy of Iyanla’s book Acts of Faith 25th Anniversary. Tickets are available through the Kauffman Center Box Office at (816) 994-7222, via the Kauffman Center mobile app and online at www.kauffmancenter.org. Béla Fleck and Edgar Meyer met in 1980 and immediately bonded over their love for music. Béla later met Zakir Hussain at a festival workshop. The trio eventually collaborated for a triple concerto for the Nashville Symphony in 2006, and the rest is history. To be a part of this history, see their concert in Helzberg Hall at the Kauffman Center for the Performing Arts on Wednesday, October 9 at 7:00 PM. Tickets go on sale Friday, February 8 at 10 AM and range from $29-$89 plus applicable fees. Béla Fleck, a 15-time Grammy Award winner, has been nominated in more categories than any other artist in the history of the Grammy Awards. He has performed his premier stand-alone banjo concerto, The Imposter, over 50 times internationally. Through his genuine passion of music, Fleck will introduce audiences to a diverse set of music genres through his creations. Zakir Hussain is a national treasure of his own country, India, as a classical tabla player. A tabla is an Indian drum, classically used to accompany vocal and instrumental music, as well as dance. His stage presence is marked by masterful improvisational and dexterity, founded in intense knowledge and study. Edgar Meyer, a five-time Grammy winner, began studying bass at the age of 5 under his father. Hailed by The New Yorker as “…the most remarkable virtuoso in the relatively un-chronicled history of his instrument.” He has been brought to the fore front by his incomparable technique, musicianship, and a gift for composition, attracting a broad and diverse audience around the world. This event is part of the 2019-2020 Kauffman Center Presents series.